Two final games of round 4 2013 V – League ended with 2 draws. On Hang Day pitch, Ha Noi T & T and SLNA had a dramatic 2-2 draw. Hosting “hitter” HAGL from highland, Dong Nai players seemed to be rebirthed after their draw in last minutes of game on Bien Hoa stadium. The most wanted game in round 4 2013 V-league was totally satisfied audiences. Not only beautiful goals on grass, Hang Day stadium was filled up with cheers from both teams’ fans. the confrontation betweeen Ha Noi T&T and SLNA was compared with the fight between water and fire.In fact, this game was not only battle of two teams, on bench,but also the mind fight between two famuos coaches Thanh Hung and “young boss” Huu Thang. 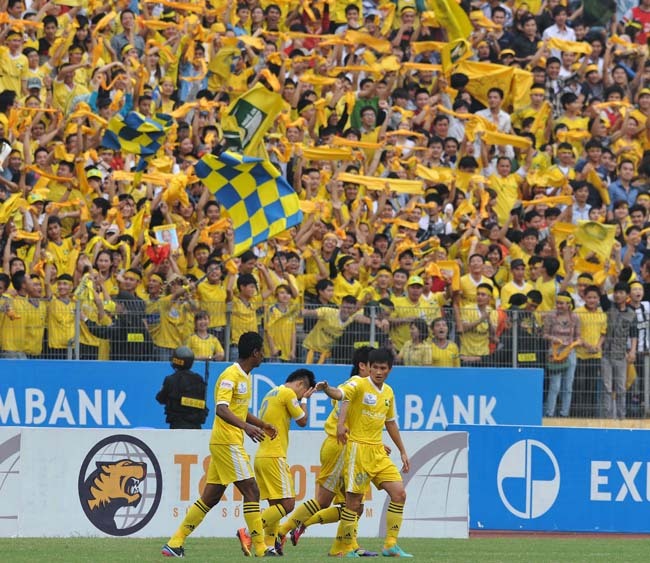 Despite playing away from home, Coach Huu Thang and players received much encouragement like at Vinh stadium, because Nghe An fans have yellowed Hang Day pitch. Right 10 minutes later, Gonzalo created a super-beautiful goal that caused thousands Nghe An fans dumfounded. The ball was passed by Quoc Long, Gonzalo volleyed and scored 2-1 lead for the host. On the bench Coach Huu Thang had an appropriate change which was showed after 7 minutes after Hanoi T & T’s goal, Hector pushed two teams returned to the starting. 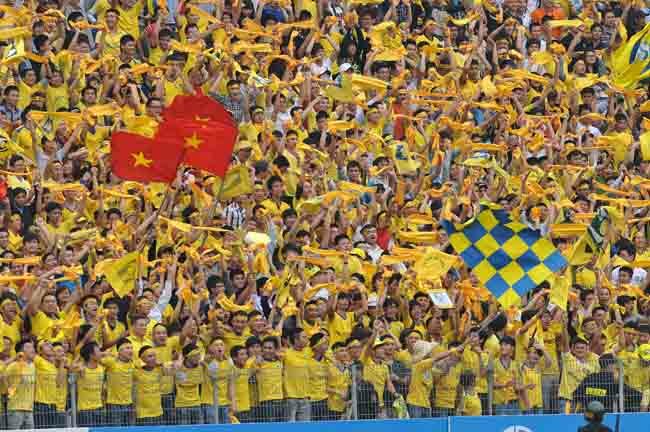 Inspite of Inconclusive result after 90 official minutes, Ha Noi T & T and SLNA’s battle sastified fans over country. The game attracted with two coaches’s tactics, enthusiasm of audience on stands, four goals were shared equally and football fans had a spiritual entertainment last week. 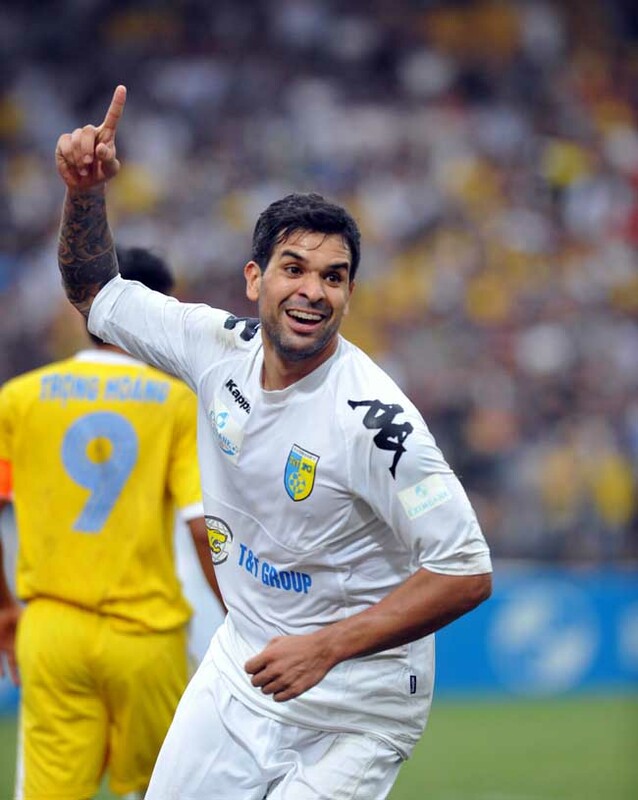 Mr. Tran Binh Su and players were full of confidence in 3 points when hosting against HAGL. However, visitors’two goals from Oseni Evaldo in 22nd minute and 46th minute extinguished host’s ambition. However, two early goals and easy array againts weaker opponet became subjectively. Midfield was gradually for the host. Dong Nai’s Hoang Phat Thierry shortened the gap to 1-2. Dong Nai spiritually overwhelmed HAGL with continuous attacks. Consequentlty, Dong Nai’s Thierry equalized Vietnam when he added his name again in last minutes of the match Attain one point against HAGL, thanks to Hoang Phat Thierry; nevertheless Dong Nai’s unstable performance caused a difficult future forecast for them.